Lots are vacant. The vacancy rates of rental & homeowner properties, 1980-2015 (by number of units in property). The vacancy rates of properties owned by families and rental owners are not yet close to the historical lows but they are coming down from the highs of 2008-2010 recession. Note that single unit houses are rented out more often than multi-unit houses. 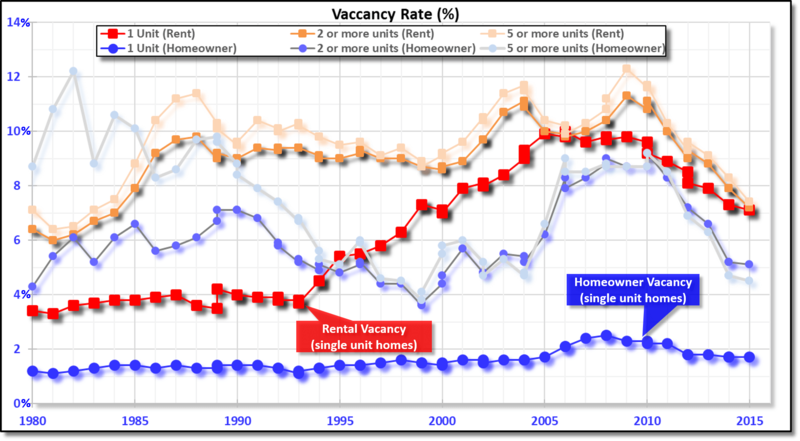 The rental units have a much higher vacancy rate due to more choices and lot of turn over. (Click on image to enlarge). Source: www.census.gov.